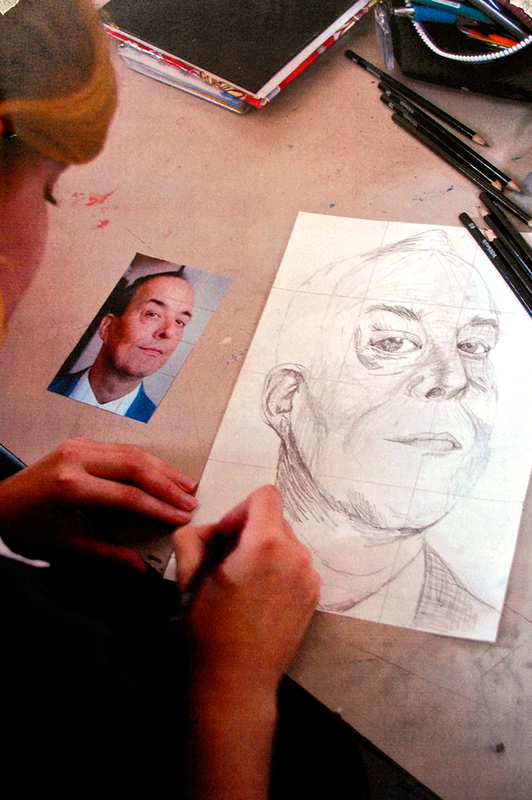 Year 11 students were given a brief to produce a portrait of a member of staff. They needed to bear in mind the types of portraits that grace stately reception rooms or grand hallways from age old institutions; another inspiration was the style of portraiture that hangs in Hogwarts. Official parchment style scroll invitations were sent to the members of staff and a date was set for capturing their likeness in a photograph. Students initially developed drawing techniques using "Hatching" inspired by old master drawings to render tone and form. They used the old fashioned grid method to enlarge their drawing and then transferred the image onto canvas. Art teacher, Mr Tibbetts-Williams said..
"Before we started the paintings we discussed and demonstrated the technique of ‘Glazing’ and working from ‘dark to light’ to allow students to rethink how they paint shadows and render flesh tones convincingly. Although students found the task challenging and at times frustrating, the outcomes are very rewarding, the students should be delighted with what they have managed to achieve because they have created some excellent portraits." Newer PostY8 & Y9 Wellbeing Evening 9th May.